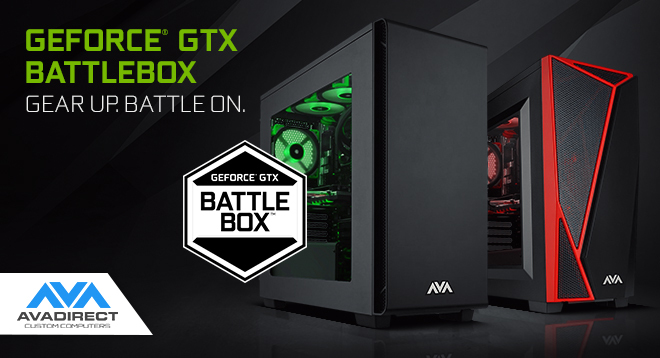 Get Battle-Ready With An AVADirect GeForce® GTX Battlebox System And Dominate The Game! Now you can step up your game with a ready-built gaming machine, with the launch of the GeForce® GTX Battlebox systems. Configure an AVADirect Battlebox Ultimate or Battlebox Essential, built with the world's best graphics cards and the latest high-performance hardware, for an incredible gaming experience right out of the box. These powerful rigs can handle anything you throw at them, so you can go to battle— and win. Enjoy stunning visuals in 4K and be VR ready for an immersive gaming experience with superior performance. Gear up and battle on now.